For several years, the infusion of technology into education has been occurring at dizzying speed, often at a 1:1 scale. 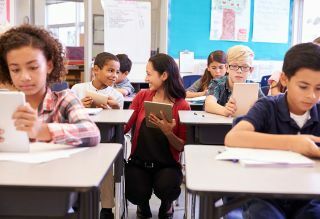 However, as anyone who has led a digital conversion knows, deploying the devices and software subscriptions is only the first step in the ultimate goal of edtech—changing the pedagogy of the classroom teacher for the better. I speak from firsthand experience when I say that it can feel like the mission has been accomplished after the completion of the initial implementation. Given the substantial amount of community support, funding, infrastructure upgrades, and professional development required to complete the initial rollout, many schools view this feat as the endgame, rather than the beginning. Sadly, if a fundamental shift in classroom instruction does not occur, what schools have actually accomplished is the conversion of a low-performing (or high-performing) school into a digital low-performing (or high-performing) school. If the devices are being used to run low-level apps (digital flash cards) or automated remediation programs, or worse, if they serve as $200 note-takers, fundamental instruction has not changed. If, in the words of Wisdom Amouzou, the Executive Director of Denver’s Empower Community High School, devices are being used to “kill and drill” instead of “code and create,” schools have only exacerbated the digital inequity that existed prior to their digital learning initiative. At a recent Tech & Learning Leadership Summit, edtech leaders considered follow-up steps to a 1:1 initiative. Two prominent case studies from two innovative and tech-ready school districts were featured. The first district, Community Consolidated School District 59 (CCSD59) in the northwestern Chicago suburb of Mount Prospect, Illinois, demonstrated how their district had adopted four new learning priorities in response to the district’s successful technology integration initiative. These four focus points are successfully changing the pedagogy of teachers in this district: 1) higher-level thinking, 2) student agency, 3) authentic work, and 4) technology infusion. The result has been “nothing short of a paradigm shift in how instruction and services are delivered,” according to CCSD59 Superintendent Dr. Art Fessler. This innovative district is answering the question “What happens after the technology is deployed?” with a resounding, “Keep innovating.” In a district that has been 1:1 and even 2:1 (two devices per student) for years, the focus after deployment has been on using that technology to find ways to transform the pedagogy into a high-level, student-centered approach. Connected classrooms offer collaborative learning, flexible seating arrangements, and innovative lessons. Wichita Falls administrators also stressed that teachers are encouraged to take chances without fear of failure. These priorities have led to an increase in the number of classrooms addressing the 4 Cs of 21stcentury learning: communication, critical thinking, creativity, and collaboration. An analysis of these two case studies reveals similarities and differences in their approaches to innovation beyond the devices. But these districts both embody the spirit of innovation because they’re free from the fear of taking risks. Many years have passed since the very first district took a chance and deployed digital devices to every student in the district, but the capacity for positive change seen in Illinois and Texas means that the spirit of K–12 education technology innovation is alive and well! Todd Dugan is superintendent of Bunker Hill (IL) Community School District #8.